Last month, the Great Blizzard of ‘10 shut down the Music Box Theatre for the first time in 28 years, leading to the cancellation of New Cult Canon’s presentation of Death Wish 3. The message from God was clear: The event, while indisputably awesome, was not quite as awesome as it needed to be. So we’ve done more than merely reschedule; we’ve expanded. 7:30 p.m.: Death Wish 3. The sublimely insane second sequel to the 1974 vigilante hit may be the ultimate you-kids-get-off-my-lawn movie, pitting Charles Bronson’s almost superhuman avenger against a band of troublemaking whippersnappers. 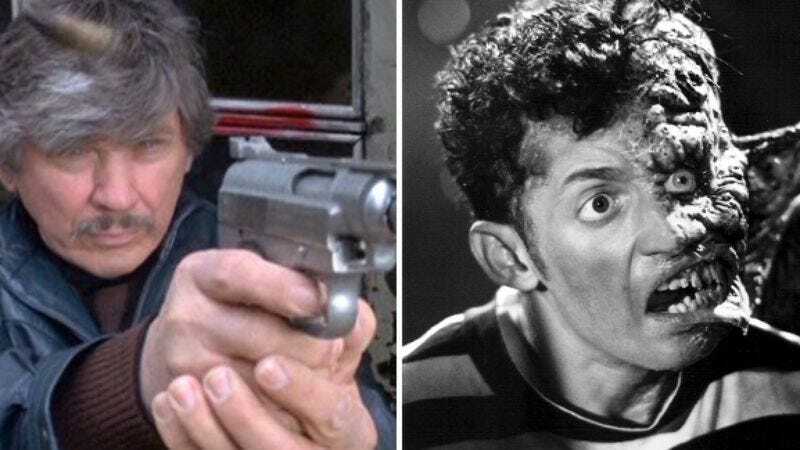 The New York of Death Wish 3 is like a real-world The Warriors crossed with a paranoid right-wing small-towner’s vision of big-city menace: a gang-infected war zone, lorded over by the cast of Breakin’. It’s crazy, it’s violent, it’s altogether stupefying. Between screenings: A Q&A session with Alex Winter. 9:45 p.m.: Freaked. Fox buried Winter and Stern’s wonderfully idiosyncratic comedy, but it was embraced by a fervent cult following on home video. Rarely screened and no longer available on DVD, this is the ideal opportunity to rediscover it. Winter stars as Ricky Coogan, a likable spokesperson hired by a company after a toxic chemical tarnishes its corporate image. When Ricky flies down to South American to see the chemical’s effects for himself, he witnesses the bizarre goings-on at a mutant freak farm run by the deranged Elijah C. Skuggs (Randy Quaid). Featuring an eclectic cast—including Brooke Shields, William Sadler, Morgan Fairchild, Bobcat Goldthwait, an uncredited Keanu Reeves, and Mr. T as a bearded lady—Freaked pays homage to everything from Tod Browning’s Freaks to the stop-motion magic of Ray Harryhausen, all while staking out a manically funny tone of its own. Tickets are $11 in advance and $12.50 at the door. They can be purchased online here. Details on a pre-party coming soon. And while we would never encourage the intake of illegal drugs, we can think of no more wholesome, clean-living way to observe 420.